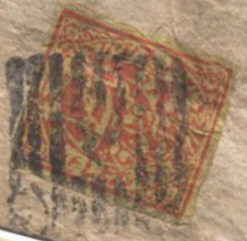 Some familiarity with the Takrī class of scripts, to which Dōgrī belongs, proves helpful to the Kashmir covers collector. Covers display a vast acreage of these cursive sprees, but so notorious is its reputation for difficulty that few collectors bother with it much. The minimum philatelic goal is to be able to discern year-dates. 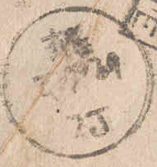 All too often a month and day is visible from datestamps, but no year. A year lurking in the manuscript comes to the rescue gratifyingly often. Diving right into the postal action is the way to go. 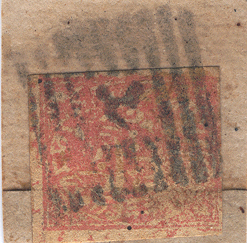 The color-coded section in red on the stamp shows the frozen samvat date “1923.” The 9-bar-9 obliterator is shown with it for comparison of the numeral 9. The 9-bar-1 is curiously absent from the 9-bar series. We might imagine that the already-venerable Jammu 12-bar-1 obliterator shown above serves effectively in that place and that it inspired the subordinate members of the numerical series. On left, the Kashmir duplex obliterator, showing how prominently the loop can appear for the symbol in question. Many commentators in the past took the central symbol of all these “unit” types to be the Persian m. Boggs (1941, p 56) suggested the symbol stood for the ص in صحيح ~ ṣaḥīḥ, which means ‘correct’ or ‘passed’, a usage known from documents. In that usage ṣaḥīḥ is abbreviated by the numeral 1° (ref. Platts), so Boggs’ identification might be regarded as not wrong on a technicality. A traditional candidate in the all-but-defunct m-theory has been mahsūl for ‘postal tax’. The middle image is of the ‘Syalkoţ’ duplex dated bhādo 15 in the lower row, where we note particularly here the telling form of the 1. 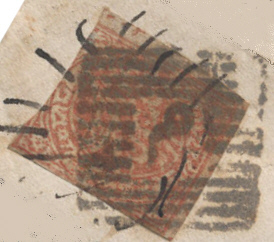 The third image shows the date 1804 taken from a Sikh coin or token. 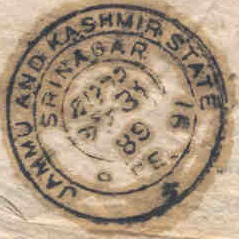 SRINAGAR 3-ring dated in the center māgh 31 47 ~ 10 February 1891. What looks like an ‘89’ at the bottom of the central ring is the native ‘47’. The year-date at the bottom of the inner circle is ‘48’ ~ 1891. On left: baisākh 28 ~ May 8. The 8 was inserted the wrong way around on the implement (compare preceding scan). On right: ćait 26 ~ April 6. Left, asū 9 ~ September 23, which is consistent with the English dating on the railway marking. Right, jamu jeţh 19 ~ Jammu May 30. ॥74॥ or 74½ (the half being represented by two vertical strokes (as on the half-anna circulars.) 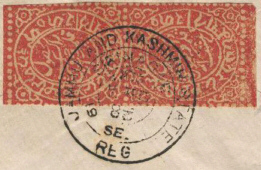 Some such combination as these appears on virtually every Jammu-Kashmir cover, and others beyond. It is said to be a symbolic warning to those who would tamper with the letter. Do read the fascinating footnote in Staal, pp. 124-5. 1912 samvat ~ 1855-56 AD. In each AD conversion, the span of months is from about April 12 to the following April 12 (1 baisākh) using the solar convention. 1924 ~ 1867-68 (odd, perhaps a botch, but this did come with clear cover corroboration). The standard 4 is the γ-thing seen in the 1940s entries. 1929 ~ 1872-73. (With thanks to Max Smith for these two images). 1934 ~ 1877-78; last with asū. 1940 ~ 1883-84. Second image 21 1940. 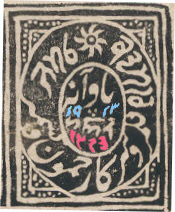 A seldom-seen hejri date in this script: 1305 ~ (Sept) 1887 to (Sept) 1888, with cover corroboration. The 5 and the variant 8 can be confused for one another. Takri (formally Ţākarī) is a class designation for certain of the popular scripts of northern India. They are descended from an older (14th-c) official and religious script known as Devāśesa, which in turn was a development of the old Śāradā system (~ 8th century) from which the Gurmukhi (Punjabi) and Landa scripts developed as sister lines. It appears to be a complex story, not thoroughly chronicled. As to main divisions, one reads of divergent local traditions for the writing of Chambeali (in Chamba), Kishtwari, Jaunsārī (Sirmaurī in Sirmur), Kulvī, Dogrī-Kangrī, and others. The Dogri form of Takri became even more divergent through attempts at official reform by Maharaja Ranbir Singh in the 1860s (New Dogri Script ~ name dogra akkhar). If you want more information about these scripts, check out possible leads under such other names as Baniyā (‘merchant’), Wāniko, Lamawasi, Lundas, and Shawara. Some of our gleanings have been taken from ancientscripts.com, for which we are grateful. With warm thanks to Max Smith for providing extremely helpful material on the Northwestern Indic scripts.